Petit St. Bernard: (Stone Circle). Called Piccolo St. Bernardo by the Italians. This stone circle sits around 2,190m above sea-level in the Alps at the prominent watershed of the Petit Saint Bernard mountain pass which denotes the modern border of France and Italy. 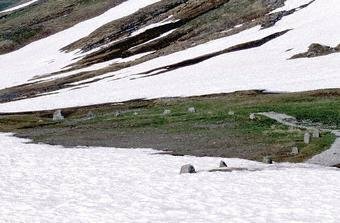 The Petit Saint Bernard stone circle is believed to date back to the second or third millennium BC. It was re-discovered last century and its large diameter (72 m - 236ft) makes it an important European stone-circle. Forty-six low stones remain, but originally there were probably more, as the site is now crossed by a road which almost certainly destroyed several others. According to some sources a dolmen once stood in its centre, opening to the summer solstice. A porphyry stone pillar, known locally as Columna Jovis (Jupiter's Column), could also have been part of the circle. This column now acts as the pedestal for a statue of San Bernardo, and stands near the stone ring. Ancient books say that in Roman times there was a big ruby called 'Jupiter's eye' or 'Escarboucle' on top of the pillar. In the Alps near the sky, where the rocks are getting lower and let you cross them, there is a holy place where the altars of Hercules rise. Winter covers it with a persistent snow and it raises its white head to the stars. A group of three large stones is aligned to the point where the sun sets at the summer solstice. It is speculated that these three stones are the stones from the dolmen which once stood in the middle of the circle.